For years my spouse and I have had a Saturday date-night tradition. The current version of this tradition is that we take turns choosing a surprise date activity to do together at some point on Saturday. Our dates range widely from free to occasionally indulgent, and have included all kinds of things including movies, hikes, museums, food, concerts, art galleries, and even escape rooms. This week it was his turn, and he decided that we were going to go to Powells (the enormous bookstore in Portland) and spend the afternoon browsing books, reading and drinking tea in the rainy windows of their cafe. It was a very sweet way to spend the afternoon. My favorite part about our tradition is that it avoids the problem of having to agree on something that we both want to do, because the other person usually doesn’t find out what the date is going to be until it’s happening, and therefore can’t argue about it! We’ve noticed that this arrangement also allows us to continue to share our individual interests with each other, despite having been together for many years (7 years this month!). 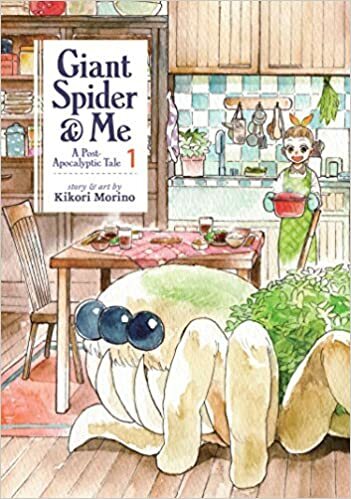 Anyway, this afternoon we found ourself in the graphic novel section reading a cute manga story about a girl that befriends a giant spider and basically cooks vegetarian meals for it throughout the entire book. The reason I’m telling you this story is that in this comic, there were recipes included, and we became intrigued. Pretty soon, we’d made dinner plans and a grocery list. So, from Giant Spider and Me, here’s a recipe for Japanese-Style Miso Ratatouille, which I’m sure is an odd English translation of the name of the dish from Japanese. In the story, the girl made some rice balls (onigiri) to accompany the ratatouille, on her picnic with the giant spider named Asa. Since I’m on maintenance and needed a grain accompaniment, we made some of those too. I’ll write up a post about how to make onigiri someday, but not today. They are very easy to make and weigh, and so tasty! For protein, one could complete this meal with some steamed or boiled edamame, baked tofu (try coating tofu with sesame seeds and garlic powder and baking on parchment paper at 350 degrees for 15 minutes or so), tofu sautéed in a skillet with soy sauce, or some miso soup with cubes of tofu in it. Here’s a good miso soup recipe from Rasa Malaysia, although I’d leave out the bonito (fish) flakes to make it vegan. Fat Additions: Lay avocado slices over the onigiri rice balls. Chop the eggplant into large 1″ chunks. Note the weight of the eggplant. Dice the peppers, and zucchini into large chunks. Weigh separately from the eggplant, but note the total weight. Dice the onion into large chunks, adding enough to the total weight to reach 4 veggie servings, INCLUDING the can of tomatoes. Personally, I add 1 oz of veggies per serving of veggies to account for the loss of weight when cooked down. Do what works for you. Remove a handful of the onion and mince finely. Combine it with the minced garlic clove. Heat 3 TBSP of the oil in a large skillet over medium heat. Add the eggplant pieces and stir. They will absorb the oil fairly quickly, but it shouldn’t stick. Stir fry the eggplant for about 10 minutes, stirring frequently, until softened. Heat the remaining 1 TBSP of oil in a large pot over medium heat. Add the minced onion and garlic and stir for a few minutes, until fragrant. Add the remaining veggies, including the eggplant and the can of tomatoes. Add the bay leaf also. Cover with a lid and simmer over medium heat for 15-20 minutes, stirring often to prevent it from sticking. Towards the end of cooking, stir in the tablespoon of miso paste. Divide into 4 servings and accompany with your choice of protein and onigiri rice balls (see below) if eating grains with your meal. Sweet Katie! That is lovely& funny getting inspired by that comic book! I will def. Give it a try next week. Are you getting more Japanese styled idea’s of it? Thank you for sharing. ( my husband an i had a tuesday surprise , we went then alway to a restaurant, just the 2 of us, leaving the kids behind with our neighboures daughter .. incredibal how many restaurants there are in Amsterdam, we never went to the same twice. , we then had time to talk and give each other attention without the children . Sure! Swap it out for more zucchini, yellow squash, peppers, tomatoes, onions, etc. I’d skip the frying pan part in that case I think, the point of which is to precook the eggplant. Made this last night for dinner (and meals later on in the week) it was really tasty. Because I was doing other cooking as well I ended tossing it all together and roasting as you do with your melty eggplant dish. I then simply added on the miso when it was done roasting. Thank you so much for your recipes, it has challenged me in a good way to adapt other recipes into BLE friendly dishes. Loved this! I have never cooked with Miso and wasn’t even sure I would like it but decided to be adventurous. I also was convinced this would be bland with so little seasoning but it was amazing! I used a mild white miso and think I will try a stronger variety next time. Thanks for another winner, Katie!